Founded over 15 years ago by the current proprietors David and Suzy Findley, MMM is uniquely placed to supply quality marquees for any event – but particularly where site conditions are more challenging - EG smaller gardens or more awkward areas! So often people are put off from using a marquee - believing their garden or driveway area is simply not large enough. Don’t let your eyes deceive you! 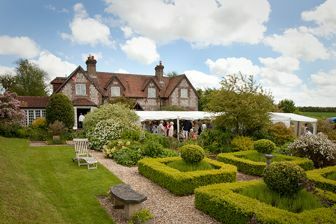 Usually there is more square footage available than you might first have realised and a free professional site inspection will instantly advise the size of a marquee that could be installed – and thus the number of guests you might accommodate. If need be we can link the marquee to your house or conservatory, so you might achieve a temporary copy of the extension you’ve often dreamed about! 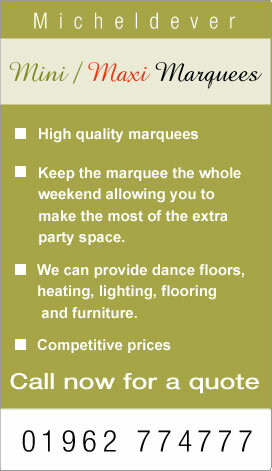 We are experts in designing a marquee system to suit a property, so please call us. Our site visits are totally non obligatory and with many years worth of experience, we like to think that if we can’t help, no one can! So please do call to arrange a helpful, friendly impartial site visit, at weekends or evenings if you prefer. Please telephone Winchester (01962) 774777. Please be careful about using lightweight ‘blow away’ gazebos! It might be an amusing story in years to come – but your guests arriving in their best clothes- won’t appreciate a deluge in the middle of their meal! Gazebos should only be used in circumstances where your house is large enough to accommodate all the guests - should the weather turn against you. Otherwise all your planning, hospitality and reputation is at risk - and your function will be remembered for all the wrong reasons! Micheldever Mini Marquees use a strong aluminium frame construction and are tested against strong winds and even snow loadings! So they are suitable for all year round usage – whether hot summer days or cold winter nights – where our low cost efficient heaters will keep you warm and cosy. The modern ‘clear-span’ method of manufacture provides a clear open plan floor space – without the intrusion of centre poles. This system also avoids the need for extending guy ropes - that can be such a trip hazard – as well as taking up sometimes-vital extra space. 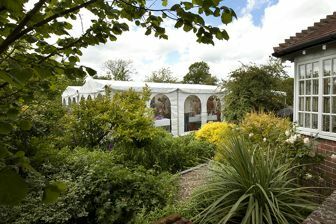 Covered walkways can be supplied in situations where it is not practical to locate the marquee adjacent to a property. A recently introduced FEATURE is our bespoke ‘L’ – shaped marquee – specifically designed and manufactured for MMM. Using this interesting idea, you can create a ‘Courtyard Feature’ area, where your guests sheltered from prevailing winds, can enjoy outdoor dining or pre dinner drinks ‘Al Fresco’ style! You have the comfort and protection of the marquee right beside you – where we can place low cost heaters for cooler evenings. All our marquees are supplied with plain or clear see-through arched window walls. Depending on weather conditions you can fully open or the walls to suit – open on a hot sunny day, so the marquee acts as a sunshade canopy – or closed against the winds, thus acting as a secure windbreak. Use our design service to maximise the space in your garden for your guests. We can install on grass, patio or other hard standing using our portable weights system – thus avoiding damaging to the surface.